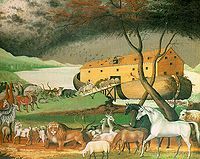 Noah's ark, if discovered, would have a profound significance to the Christian community as a whole. For some, the discovery would serve to reaffirm their faith in the Bible by validating the account of the Great Flood in Genesis. It would prove once again that the Bible is accurate and can be accepted as true. It would also convince many people that the worldwide flood, now relegated to the realm of myth, actually occurred. This in turn would challenge currently held ideas of uniformitarianism and the evolutionary view of the fossil record. 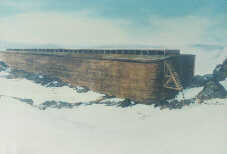 If a boat as large as the ark were to be discovered on the summit of Mt. 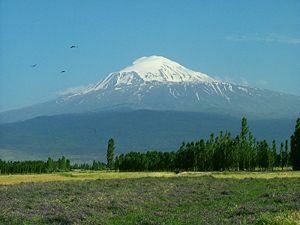 Ararat, it would point to a global flood large enough to float the boat to the top of the mountain. John Morris has made thirteen visits to Mt. Ararat in search of Noah's ark. He went on his first expedition in 1972 along with John Bultema, Roger Losier, John Seiter, and Bill Ellison. When invited to join the Cummings-Irwin group in 1982, Morris formed a separate expedition group sponsored by the Institute for Creation Research (ICR) that would work in conjuction with the Cummings-Irwin group. 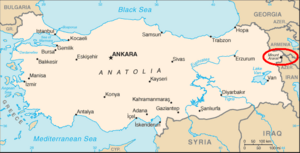 After allowing the Cummings-Irwin group to explore the mountain, however, Turkish officials were reluctant to let another group in. Therefore, the ICR expedition was delayed and was unable to join the Cummings-Irwin group. Among the evidence Wyatt claims to have found are: stone anchors with eight crosses representing Noah's family, petrified wood samples from the ark, preserved animal parts, and metal braces. 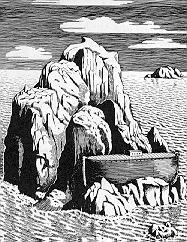 Andrew Snelling of Answers in Genesis argues that the purported drogue stones (anchor stones) show no signs of wear, such as would be the case if they had been attached to the ark by ropes. He notes that the holes in the stones are too close to the edge, meaning that the weight of the stone would cause the end to snap off. Additionally, not all of the stones have eight crosses carved into them. In actuality, some have three while others have twenty. Snelling also observes that God was directing every step of the ark-building process; Noah and his family relied solely on God for protection and guidance. God even shut the door to the ark. Therefore, since no mention of anchor stones is made in the detailed guidelines God gave Noah for building the ark, it is unlikely that they would have been added and their presence would seem out of place because they would give Noah a way to guide the ark. 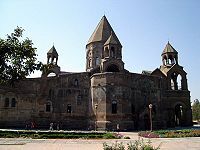 Robert Cornuke made several more trips to Iran and even went back to Ararat again. 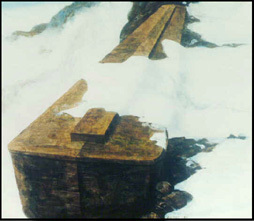 In 2005, while searching Mr. Soleiman in Iran for traces of the ark, Cornuke's team found pieces of petrified wood and possible pottery shards, which they brought back with them to be tested. While still uncertain whether the objects were once part of Noah's ark, Cornuke and his team remain hopeful that someday the ark will be discovered and proven to exist. "But of this ship that grounded in Armenia, some part if it still remains ... and some get pitch from the ship by scraping it off and use it for amulets to ward off evil." (p. 15). 1st C Jewish historian Flavius Josephus mentions the remains of Noah's ark 3 times. "... the country called Carrae: it was a soil that bare amomum in great plenty: there are also in it the remains of that ark, wherein it is related that Noah escaped the deluge, and where they are still shown to such as are desirous to see them" (pp. 16-17). "Do you seriously suppose that we are unable to prove our point, when even to this day the remains of Noah's Ark are shown in the country of the Kurds? Why, were one to search diligently, doubtless one would also find at the foot of the mountain the remnants of the altar where Noah, on leaving the Ark, tarried to offer clean and fatly animals as a sacrifice to the Lord God" (p.21). Do not the mountains of Armenia testify to it, where the Ark rested? And are not the remains of the Ark preserved there to this very day for our admonition" (p. 21). "The Armenians, and the Persians themselves, are of opinion that there are still upon the said mountain some remainders of the Ark, but that Time hath so hardened them, that they seem absolutely petrify'd. At Schamachy in Media Persia, we were shown a Crosse of a black and hard Wood, which the Inhabitants affirmed to have been made of the Wood of the Ark" (p. 22). "They went inside the Ark and did considerable exploring. It was divided up into many floors and stages and compartments and had bars like animal cages off today. The whole structure was covered with a varnish or lacquer that was very thick and strong, both outside and inside the ship. The ship was built more like a great and mighty house on the hull of a ship, but without any windows. There was a great doorway of immense size, but the door was missing. The scientists were appalled and dumbfounded and went into a Satanic rage at finding what they hoped to prove nonexistent. They were so angry and mad that they said they would destroy the ship, but the wood was more like stone than any wood we have now. They did not have tools or means to wreck so mighty a ship and had to give up. They did tear out some timbers and tried to burn the wood, but it was so hard it was almost impossible to burn it. "They held a council, and then took a solemn and fearful death oath. Any man present who would ever breathe a word about what they had found would be tortured and murdered"
In 1915, just before Haji died at 75 years old, he told his story. In 1918 on his death bed one of the 3 atheists told his story which matched in every detail. 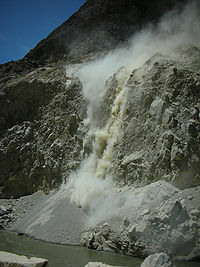 1883 AD Turkish scientists, soldiers, and a British diplomat, Captain Gascoyne, investigated an earthquake on Ararat. "At last they were rewarded by the sight of a huge dark mass, protruding twenty or thirty feet from the glacier, on the left side of the ravine. ... It was in a good state of preservation, being painted on the outside with a dark brown pigment, and constructed of great strength. ... the explorers found it filled for the greater part with ice, the interior being partitioned off into compartments about twelve or fifteen feet high..." (p. 57). "The Ark was resting on a huge rock, bluish-green in color, but one side was on the edge of a steep cliff. The mountain was impossible to climb from the side. When he looked over the edge, he could hardly see the bottom of the mist. "The Ark was very long and rectangular. Parts of the bottom were exposed and he could see that it was flat. The roof was nearly flat, except for a row of windows, 50 or more, estimated size 18 inches x 30 inches, running from front to back covered by an overhanging roof. The front was also flat. The side tipped out a little from the bottom to top. "The wood appeared to be entirely petrified" (pp. 70-71). 1916-17 Russian and Turkish soldiers entered the Ark. 1943 American Airmen photographed the Ark.